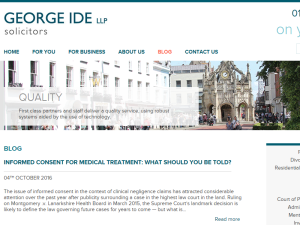 The George Ide LLP Blog specialises in providing a host of information regarding personal injury claims, what to do in the event of medical negligence, personal grievances and a wide range of other legal matters. From wills and probate to why you should consider an insurance policy, the George Ide blog is designed to provide helpful advice and insight into a number of legal situations. This what your George Ide LLP Solicitors Blog Ad will look like to visitors! Of course you will want to use keywords and ad targeting to get the most out of your ad campaign! So purchase an ad space today before there all gone! Option agreements and promotion agreements have become increasingly popular both with landowners and property developers – so what are they, when can they be used, and what differentiates one type of agreement from the other? Option and promotion agreements are ways of extracting capital from land with development potential. Both types of agreement give entitlement to an interest in the land – either to the developer by way of an option, or to a third party engaged to promote the sale of the land. However, the two types of agreement differ significantly. Under an option agreement, a landowner grants a developer the right to purchase the property for a set price within a defined period. This type of agreement is often dependent on the developer meeting certain criteria such as successfully obtaining planning permission. If the developer has a change of heart or is unable to fulfil the imposed conditions the option may expire and, as a consequence, the land remains unsold. Under an option agreement, the interests of landowner and developer are sometimes perceived to be at odds with each other – while the landowner wants to achieve the highest possible price for the land, a successful developer will want to buy the land at the lowest possible price. Under a promotion agreement, a land promoter agrees to work as the land owner’s agent. For example, the promoter may apply for planning permission, create a marketing pack, promote the land for development on the open market, negotiate prices, terms and conditions, and deal with offers. In return, the promoter receives a fee, sometimes expressed as a proportion of the net sale proceeds – under a promotion agreement it is beneficial for the landowner and developer to work together in order to realise the best possible price for the land. So, when should you use one or other of these two significantly different options? Your decision is likely to hinge on the specifics of each case, alongside factors such as the developer or promoter’s ability to develop the land. Issues around the landowner relinquishing control of the land also come into play, and it is important at the outset the agreement you choose is drafted with care to ensure it accurately reflects all parties’ intentions and is appropriate for your situation. The post Landowners have strategic choices when it comes to agreeing property development deals appeared first on George Ide. According to the Poole Council enforcement team, this is perhaps the first time in the UK that a Proceeds of Crime case has been based on the benefit of improved light to a property as a consequence of the destruction of a tree. The post Look before you lop – ignoring a tree preservation order could land you in court under the 2002 Proceeds of Crime Act appeared first on George Ide. I suspect I am not alone in acknowledging that the issue of mental capacity can be devilishly challenging. However, I am strongly of the opinion that all professionals working in the field of capacity carry a grave responsibility, in the interests of justice and of human rights, when seeking to protect some of the most vulnerable in our society. In this article, I will seek to consider fundamental points, share case studies and recollections from my 25-year career specialising in ‘walking wounded’ frontal lobe brain injury claims, and pick up on some points of importance from a couple of recent COP cases. I see myself as something of an old war horse; my vintage can be judged by reference to the fact that during my articles of clerkship, as it then was, my supervising partner was involved in the renowned Masterman-Lister (Masterman-Lister v Brutton and co  EWCA) litigation, which involved a Hampshire law firm. The case featured an attempt to reopen a ten-year old personal injury claim, citing incapacity on the part of the claimant – the Court of Appeal decided that the key question was whether a person has capacity to make a relevant decision at the relevant time. Over the years cases such as this have demonstrated that failing to get to grips with capacity can have perilous consequences. This case is still cited in the Civil Procedure Rules as important in the context of interpretation of the Mental Capacity Act 2005. More recently, I conducted a personal injury claim that was later reported as the Court of Protection case of Watt v ABC  EWCOP in which Mr Justice Charles provided guidance as to the approach that should be taken when considering whether a fund of compensation should be managed within the Court of Protection or through a protective trust fund. Mental capacity assessments made under the Mental Capacity Act of 2005 will ascertain whether a person can: understand the information they are given; retain that information for long enough to make a decision; weigh up the information; communicate their decision – and mental capacity is decision-specific. The mental capacity test has two stages: firstly, there must be proof of an illness or injury that affects the way the person’s brain or mind works. Secondly, it must be demonstrated that the proven disorder of the mind renders the person unable to make a specific decision at a specific time, although this second stage applies only if the person has been given enough support to try to make the decision themselves. Clearly this is not a straightforward area – necessarily our work largely involves dealing with the shades of grey in which lawyers thrive. My very first catastrophic brain injury case, which involved Robin de Wilde QC of Masterman-Lister fame, was partly concerned with capacity. Of course, in many brain injury claims, lifetime COP costs amount to very substantial sums, and as a consequence tend to be highly contentious and this case was no exception. My client’s first barrister – who, interestingly, was later successfully sued for negligent under-settlement under similar circumstances – advised my client, who was in his 20’s, to accept an offer of £50,000 damages. At that time, the claim was based upon the opinion of a then pre-eminent consultant in neurorehabilitation whose view was that my client should be encouraged to think more positively about his situation: “His prognosis is good, and I do not believe that he needs any professional support.” In advising my client to sack the barrister and the expert I was acting on gut feeling, really. Having appointed Robin de Wilde QC, and continuing as a litigation friend, we succeeded in a claim for COP costs and achieved an approved settlement of £1.1 million. I regularly cite this case as I still find it extremely instructive. Fundamentally, assessing mental capacity comes down to gaining an understanding of a person’s thought processes. While capacity is decision-specific, it is very important to test out how a client’s mind is working, how they think things through, how they seek support, and how they act on that support to enable the making of a sound decision at whatever level, upon whatever subject. In this case, despite offers of help my client insisted on organising his own move to a rented flat. It transpired that he spent his first night in his new place, in the dark, with no services, no furniture, laying on the floor in his sleeping bag, surrounded by lit candles. It was unsurprising, therefore, that we were subsequently able to establish incapacity. This client, who was not in the habit of asking for help anyway, did not understand his vulnerability nor realise he was in need of assistance. He struggled to rationalise, to weigh and balance information. He lacked insight. He gave the outward appearance of being fine, which is not uncommon. However, he clearly did have the capacity to decide where to live – in Southsea, Hampshire – and to choose wisely with whom to spend his time, as evidenced by the his support ‘buddy’ who worked with him for around 20 hours each week and who ended up providing enabling support for many years. This capacity, that of deciding where and with whom to live, is very important in the context of health and welfare decisions, of which more later in this article. I have always thought it fundamental to capacity to consider whether a client understands the concept of friend versus foe. For instance, if a claimant is considering whether to accept a compensation offer of £50,000 yet are more interested in what their mates have to say about it than in listening to their lawyer’s opinion, then something might be amiss. A few years ago, an injured client of mine was absolutely furious with me for advising him, as a litigation friend, not to accept a £75,000 settlement. He said: “My mates tell me that I’m fine and my case needs sorting out … Take the money!” He regularly phoned the defence solicitor to make threats against me and called me in person most weeks, ranting down the phone at me – he saw me as a block, or barrier, between him and his money. However, it became clear in the final body of evidence that he was by reason of his brain injury (neuro cognitive, organic behavioural and personality disorder) fixated on me as ‘the enemy’. It was therefore impossible to reason with him, stuck as he was in his mind that all he wanted was his money. His litigation friend, a family member, was in an unenviable position and quite understandably did not feel comfortable challenging him. He simply would not listen. Applying the 2005 Mental Capacity Act, he could not weigh information in order to arrive at the decision and he could not be supported in the decision making process. We eventually succeeded in a securing a substantial seven-figure settlement that included long-term COP provision. Taking very detailed, focussed and analytical witness statements is, I have found, of vital importance as they can provide a window into the injured person’s mind. For instance, close friends might explain that a client will unquestioningly do anything he is asked by one of his trusted friends; a case manager might report that the client has said that his problem is not his brain injury but his solicitor. If I attempt to advise and seek instruction from a client who is thought to lack litigation capacity, I know in advance that I will need to keep a very careful note. If I am taking a client through a funding agreement, for example, I will give them a short succinct summary of the key points, including the fact that if they lose their case, they will pay nothing. If I am met by a look of utter confusion or a blank stare, which is not uncommon, this can be an early clue to all not being well. If I am unsure, I tend to enter into the funding agreement with the injured person in their own right and also through their litigation friend, depending upon the eventual determination of capacity. The case of Blankley (Blankley v Central Manchester…NHS Trust  EWCA) provides important protection to a lawyer in that first meeting situation: a funding agreement entered into with someone who is later determined to lack capacity remains valid – although, in law, a contract can be declared void upon clear evidence of incapacity at the time it was entered into. I recently had a lively debate with an eminent consultant neuropsychiatrist about the Mental Capacity Act 2005 fundamental of ensuring sufficient support is in place to enable a decision to be made. If, with support, the person can understand and weigh and balance the relevant information, then make and communicate a decision, that is fine. However, in practice I have found it wise to ask who whose decision it is: is this my client’s decision or are they merely articulating the opinion of someone they trust? In my experience, if a client engages rationally in a conversation and asks good questions, that is a positive sign. Finally, I would like to consider a few points from recent cases. In Re A (Capacity: Social Media and Internet Use: Best Interests  EWCOP2 and Re B (Capacity: Social Media: Care and Contact  EWCOP3 (Cobb J), the court considered the need to focus on ‘salient’ factors when looking at the ‘relevant information’ that must be understood, used and weighed by the claimant in order to arrive at a decision about internet and social media use. These were held by Cobb J to include: “If you place rude or offensive material or images on social media, or share those images, other people might be upset or offended.” Although the capacity point was quite niche, this case provided an example of clear judicial thinking about the thought processes and level of understanding that underpin a sound decision. In Re B (above), Cobb J offered the following general observation: “I have reminded myself of the importance of establishing the causative nexus between the impairment of mind and the inability to make decisions.” This is a founding principle of the 2005 Mental Capacity Act. The case of Southend-on-Sea BC v Meyers  EWHC (Hayden J) considered the decision-making capacity of a vulnerable father in an ‘unhealthily’ close relationship with his son. The judge held: “The admirable features of Mr Meyers’ personality have become confused and distorted in a relationship in which the two men have become so enmeshed that the autonomy of each has been compromised. In reality, KF exerts an influence over his father which is malign in its effect if not its intention. The consequence is to disable Mr Meyers from making a truly informed decision, which imparts directly on his health and survival.” It is worth focussing on the words “truly informed” – we often ask ourselves whether, even if someone does not follow advice, they ‘get it’. Of course, individuals are entitled to make what may turn out to be a foolhardy decision but they must be able to understand, rationalise, and at least be capable of seeing another’s point of view, even in a simplistic way. As an eminent QC once said to me, it is all about understanding the thought processes. Paul Fretwell is a solicitor and Head of Personal Injury at George Ide LLP, Chichester. He is an APIL-accredited senior litigator and brain injury specialist and has been a member of the Law Society’s personal injury panel since 1994. The post Mental capacity – the devil is in the detail appeared first on George Ide. The post Celebrating one hundred years of women in the law appeared first on George Ide. The post Neurorehabilitation – an essential way forward for brain injury patients appeared first on George Ide. The post Dangerous bad driving ruins lives – now’s the time to kick the habit appeared first on George Ide. If you are the owner of George Ide LLP Solicitors, or someone who enjoys this blog why not upgrade it to a Featured Listing or Permanent Listing?